In the beautiful kingdom of Kanchi, there are so many temples ~ among which there are many Divyadesams…. One such is ‘Thiru Padagam” – sung by Thirumazhisai Piran, Thirumangai Mannan, Boothathazhwar and Peyalwar. 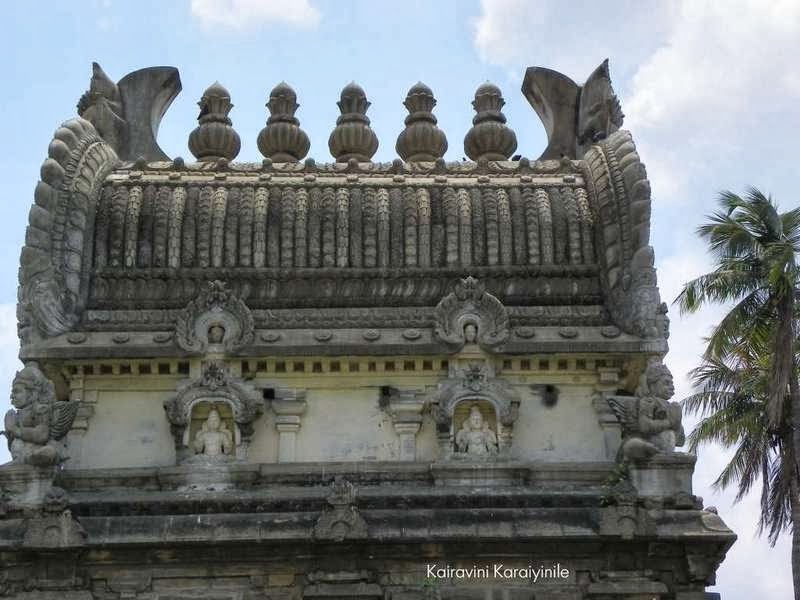 The essence of the greatest epic “Mahabaratham” – is the story of ‘The Man who went as Ambassador ” (Thoothu sendravan Aerram) …. 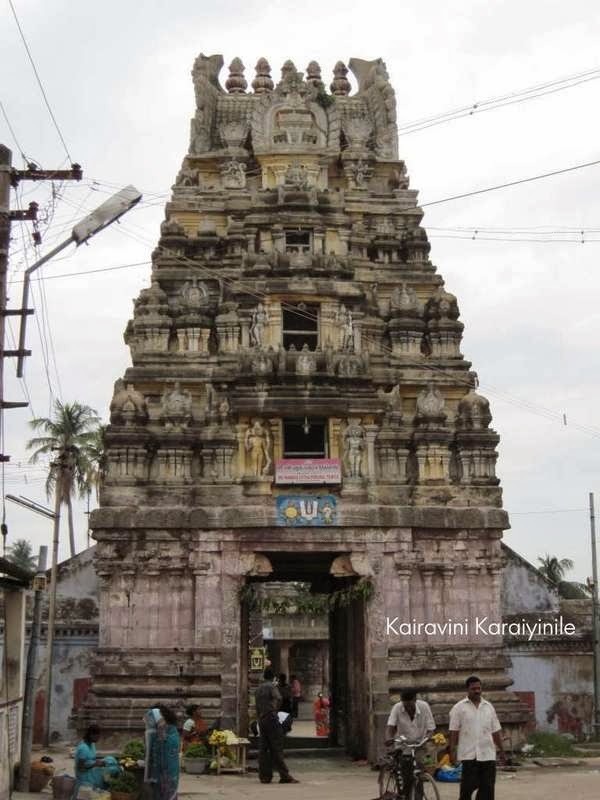 ~ and the presiding deity at this Divyadesam is Lord Krishna Himself as “Pandava Thoothar” – in a sitting posture, gigantic, imposing with ornately carved dress. 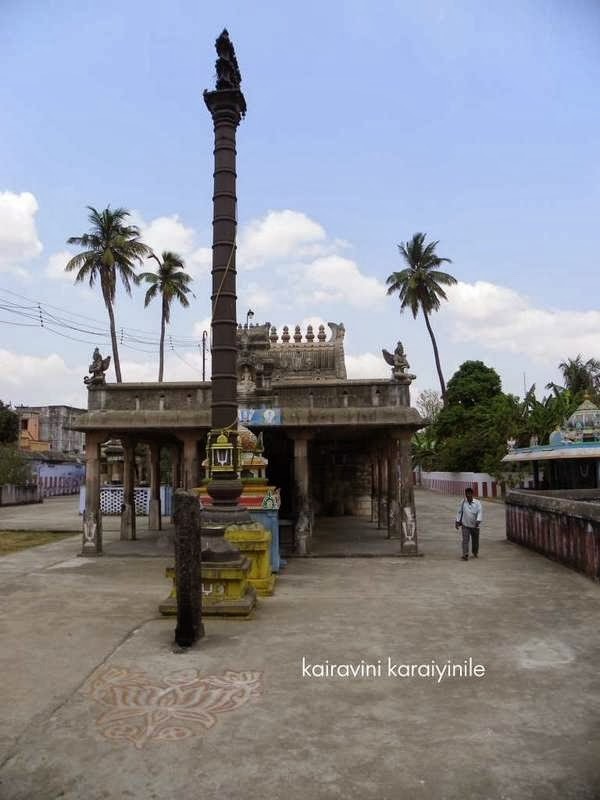 Legend has it that King Janamejayan listened to the epic Mahabarat from Sage Vaisambhayana and got enlightened by the event of Lord Krishna going as emissary to the Rajyasabha of Gauvaras ~ the King upon doing penance and Aswamedha yaga, had Viswaroopa darshan of Lord here. 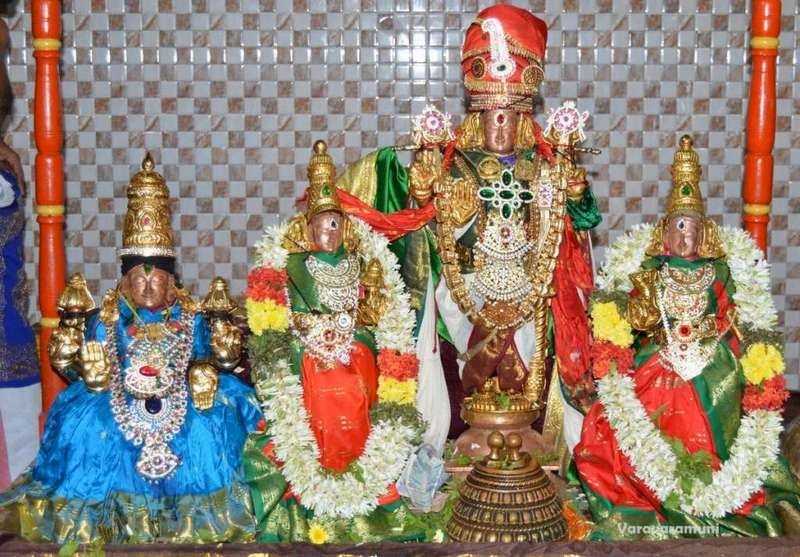 The Presiding deity is Pandava Thoothar in sitting posture with Rukmini and Sathyabhama nachiyars. 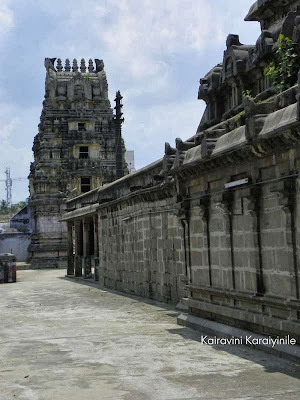 The temple is quite ancient and is believed to have been built by King Rajakesari Varman. This temple is nearer the big Ekambareswarar temple, in the vicinity of Sankara Mutt and Gangai Kondan Mandapam. In the sannadhi, there is (besides our Acharyar Sri Ramanuja) – Arulalap Perumal Emperumanaar also. Known earlier as Yagna Murthi, he was a great scholar who defeated many people with his ‘tarkha vatham’ i.e., Tarkham (logic). It is a great study involving analytics and more. Those who were defeated in the defeat had to embrace the Advaitha philosophy. Yagya Murthy was travelling far and wide, defeating many noted scholars and the wins were getting on to his head making him haughty. He had to be defeated and be convinced of the greatness of Lord Sriman Narayana and Vishisthadvaita principles. It reportedly was a very grand debate between Yagna Murthi and our great Acharyar Sri Ramanujar – the battle of words raged for days together and appeared as if it would never end. On a particular day, when Sri Ramanujacharya could not conclusively respond on a particular point and had to retire for the day, Swami prayed to his "Aaradhana Perumal – Sri Perarulalar [Kachi Varadarajan aka Devathirajar] ~ with the divine blessings of the Lord Himself, Udayavar referred to the excerpts from Swami Alavandar's Sidhithrayam. Yagna Murthi was defeated and he bowed before Udayavar who was shining in resplendent splendour wearing 12 urdhva pundrams. He was to become an ardent disciple of Ramanujar from then on. The disciple of Udayavar was now known as Arulala Perumal Emperumanaar – as Swami Udayavar conjoined his name with that of Sri Per Arulalar. 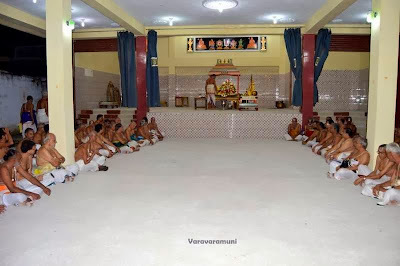 During the time of Sri Ramanujar a separate mutt for AruLaLa Perumal Emberumanar was also established. 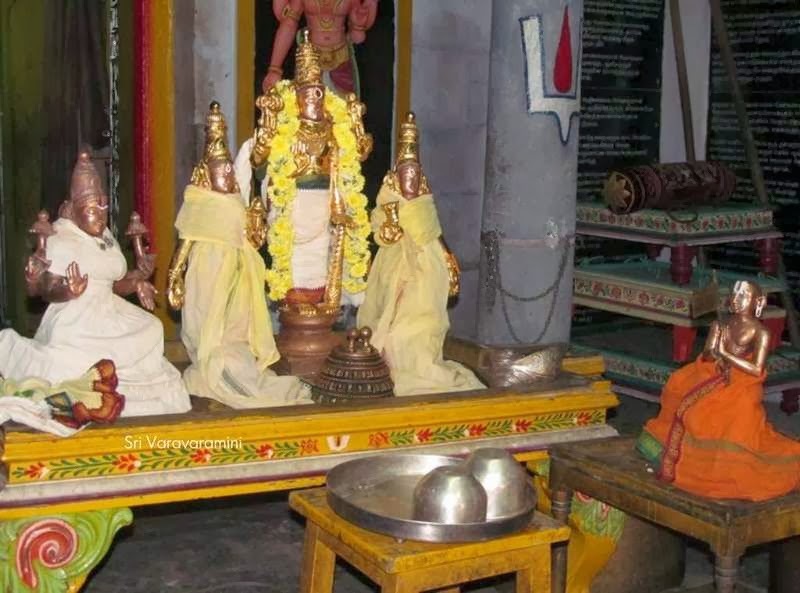 It is told by our Sampradhaya vidwans that once there were some strangers who wanted to visit Swami Ramanujar's madam. Since they were new to the place, they asked one of the locals "Where is Emperunaar's mutt?". Immediately, the local person replied them, "which Emberumaanar mutt are you looking for? - Is it the one of Swami Ramanujar (Ethirajar) or that of Swami Arulala Perumal Emperumanaar ? 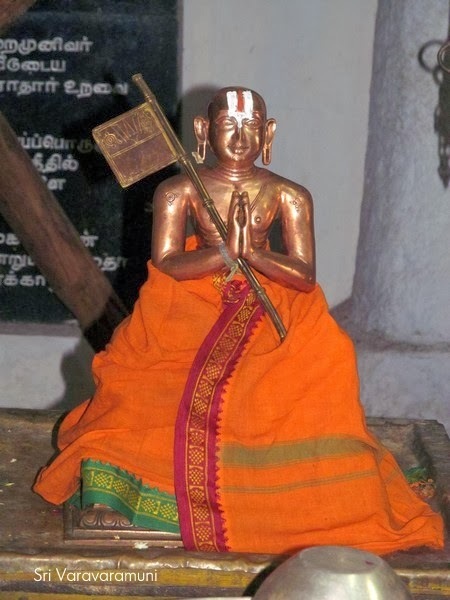 Swami Arulala Perumal Emperumanar who was immersed in his bakthi, on hearing this – wept thinking of the confusion of comparison with the Lokacharyar. 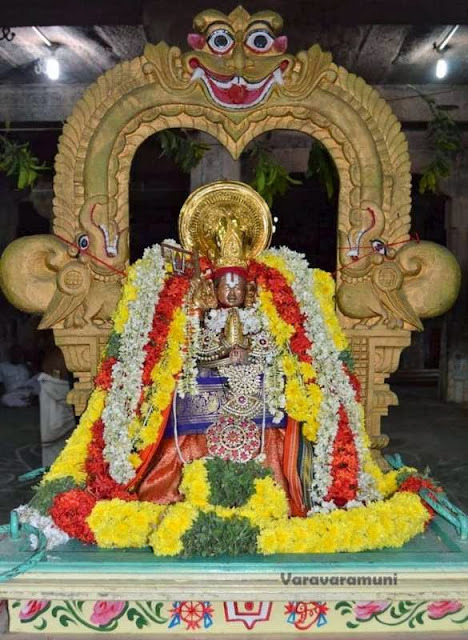 He said, in Srivaishnavic parlance, "Swami", can refer to one and only Sri Ramanujar and closed down the mutt then and there – such was his devotion and attachment. Num Swami Udayavar gave various kainkaryams to his disciples – from Sri Mudali Andan to Sri Koorathazhwan and others…… Arulala Perumal Emperumanar was assigned the task of ‘nithya thiruvaradhanam’ to Sri PerArulalan. 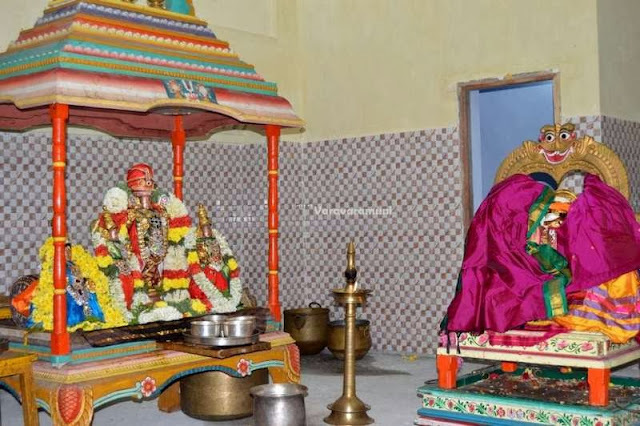 AruLaLa Perumal Emberumanar wrote two wonderful Tamil granthams called "Gnyana Saaram" and "Prameya Saaram".Sri Manavala MamunigaL has written vyakhyanam for these granthams. 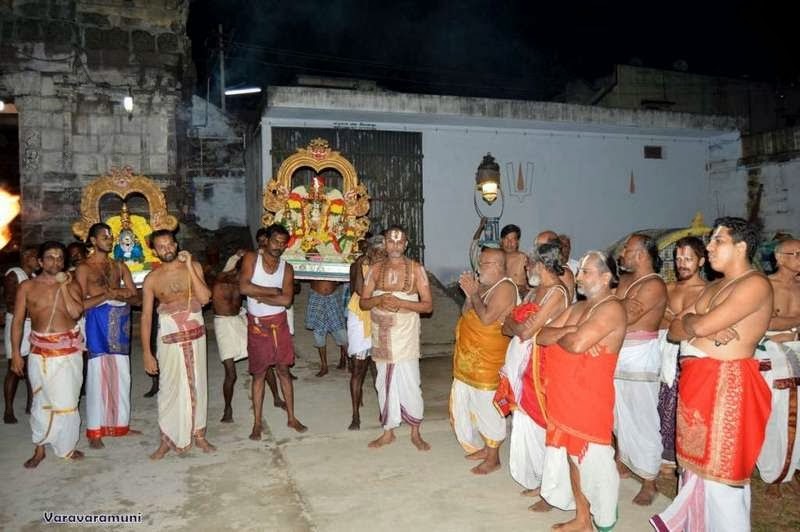 AruLaLa Perumal Emperumanar's thirunakshathiram is Karthigai Bharani, which was celebrated recently and here are some photos of the grand Uthsavam. [photos courtesy : Sri VN Kesava Bashyam Swami].